Of course, Sartre knew better. In “Paris Under the Occupation,” published a few months later, he presented a different picture of the compromises that daily life under the thumb of the Germans entailed. Here he admitted that his countrymen, for the most part, were too demoralized to resist. And yet he couldn’t quite bring himself to acknowledge how eagerly many complied. Millions of people denounced their neighbors in anonymous letters to the authorities during the Vichy era. You could say this was something of a patriotic tradition in France. During the ancien régime, secret letters led to the imprisonment of countless “enemies,” who would languish in jail, never knowing what crime they had been accused of, not even knowing the name of their accuser. The practice was stopped during the French Revolution, but the habit persisted. Under Napoleon Bonaparte it was said that half of France was paid to inform on the other half. Informers were also employed during the colonial struggles after the war. Betrayal was an uncomfortable fact of life under the Occupation, and Henri-Georges Clouzot made it the subject of his 1943 suspense film, “Le Corbeau.” Remarkably, the film was produced by a German-owned company, Continental. More remarkably, early publicity for the picture highlighted the theme: “Informing, the shame of the century!” Goodness, what were they thinking? The film was a smash hit. The Catholic Church gave it a “6” on its moral scale—“1” being appropriate for all audiences, even children, and “6” being a film so pernicious that it deserved to be banned—ensuring that it would find an audience for decades to come. 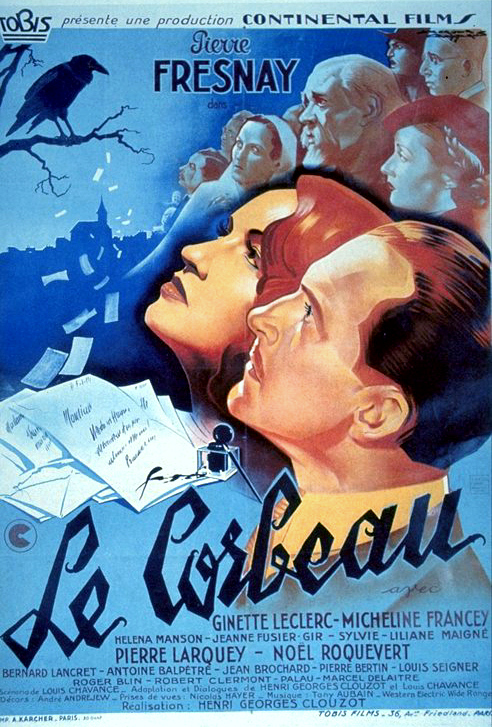 In fact, prominent critics on both ends of the political spectrum condemned “Le Corbeau.” Clouzot was accused of treason in the collaborationist newspaper Je Suis Partout; anonymous letters were “necessary” to maintain public order claimed fascist writer Lucien Rebatet. The Left, meanwhile, objected to the complete absence of admirable characters. Nobody comes off well. Not a single soul. Children, nuns, peasants, shopkeepers, teachers, workers: all are corrupted by the poison pen letters circulating in their small town. It’s only natural to seek clarity, particularly during times of upheaval. Simone de Beauvoir argued in favor of the death penalty for war criminals for precisely this reason. Salutary executions were the only means of restoring the moral certainties that were compromised during the Vichy era, she proclaimed in her essay, “An Eye for an Eye.” And yet both she and Sartre stood up for Clouzot when the postwar French government barred him from making any more films on account of his alleged ties with the Nazis. Sartre even worked with Clouzot on a screenplay during the two-year period before the ban was lifted. For his part, Clouzot seems to have been quite a piece of work. Germain’s intolerance for the hypocrisy of human nature seems to have mirrored the director’s own. He was not an easy man to work with; more than one actress complained of being slapped around on the set. On the other hand, he got fine performances out of his cast and is one of only three directors to have won the top prizes at Cannes, Venice and Berlin (the other two were Michelangelo Antonioni and Robert Altman). So, where is the shadow and where is the light? Ooh, I have to watch this one. Many thanks for the excellent tip! It’ll blow you away. The fact that a French director made this film with Nazi approval, even. Forget idiocies like “Inglorious Bastards.” This is the real thing. Watching “Children of Paradise” should be a yearly thing, the way “Wizard of Oz” was when we were kids. Thanks for reminding me — it’s been several years since I saw this film.